Lakeshore, in partnership with UAB Institute for Human Rights, hosted a two-day summit focused on creating walkable communities in Alabama. Keynote speaker and walkability expert Mark Fenton, trained participants on how to conduct a walk audit. Panels featuring national inclusive community design experts and local elected officials discussed steps individual advocates and community organizations can take to create a more safe, active and accessible environment for all people to walk, push, bike and freely move. Visitability is a growing trend focusing on designing homes that can be visited or lived in by all people. 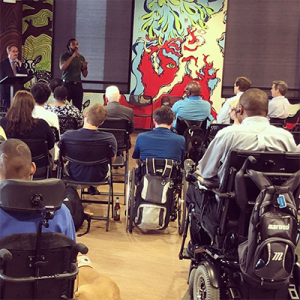 To launch this topic in Birmingham, Lakeshore and UAB Institute for Human Rights hosted a Conversation on Visitability at The Edge of Chaos. This event featured local residents with disabilities who shared their experience navigating the housing market and architectural barriers. People without access to a personal vehicle have limited transportation options to access medical care, grocery stores, merchandise, and other essential services in the Jefferson County area. 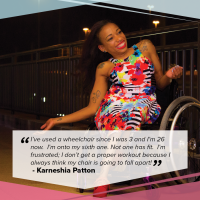 Finding information about available transportation options is a challenge for a significant segment of the population. 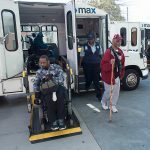 With funding from the Community Foundation of Greater Birmingham and Lakeshore Foundation, a multi-disciplinary team conducted a Rapid Health Impact Assessment (HIA) on one of the most pressing needs for mobility challenged individuals: access to medical care. Lakeshore is a proud partner of the 100 Alabama Miles Challenge, which encourages all Alabamians to record 100 miles of physical activity this year by visiting Alabama’s parks, nature preserves and rivers. This initiative provides opportunities for all Alabamians to be active and part of a community. Communities with trails and sidewalks are walkable and bikeable places where people can get outside and interact with each other. According to the Centers for Disease Control and Prevention, 42 percent of Alabama adults with disabilities are inactive. The 100 Alabama Miles Challenge will benefit public health, strengthen our sense of community, enhance our quality of life, and support economic development. Lakeshore’s policy and public affairs department is working to bridge the gap between durable medical equipment (DME) providers and people who use DME. A diverse group of men and women who use DME as well as parents of individuals with disabilities participated in four small focus groups to discuss their experiences obtaining DME. The information gathered will assist in generating a dialogue between DME users and those who inadvertently create barriers to DME use. Lakeshore, in partnership with the Alabama Trails Commission, was awarded a grant from the Recreational Trails Program funded by the U. S. Department of Transportation and a grant funded by the Curtis & Edith Munson Foundation to conduct a pilot program at Oak Mountain State Park. The pilot included the purchase of state of the art trail measurement technology, assessment of 32 miles of pedestrian trails, implementation of Trail Access Information signage throughout the park, and training of professionals and user groups on the Universal Trail Assessment Process. 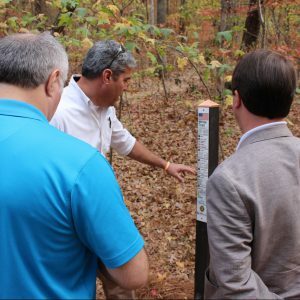 Now, Oak Mountain State Park features 40 signs that serve as nutritional labels for the trails, marking grade, elevation changes, width of pathways and surface hardness. People of all ability levels can use these signs to determine the accessibility of the trails and choose which will be best for their hike. Lakeshore is aiming to train more Universal Trail Assessors and spread this pilot to other trails and parks across the state. Lakeshore desires to eliminate the barriers to physical activity participation by working locally to support improved accessible public transportation options. In order to help promote these efforts Lakeshore received a grant from the National Center for Mobility Management. With this grant we hosted two Charrettes. The first brought together 15 agencies and three transportation providers to examine the needs of people with a disability. 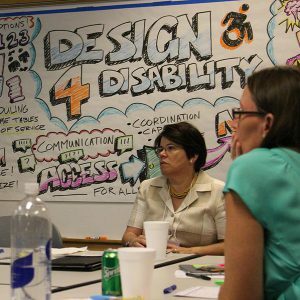 In the second Charrette, stakeholders with disability met to discuss ways to improve access to health and transportation in their local area.